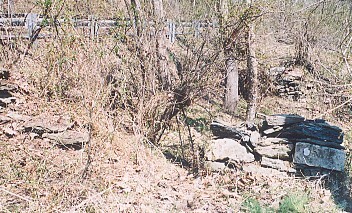 Remnants of the foundation stones walls and the millrace with a cement overflow dam. 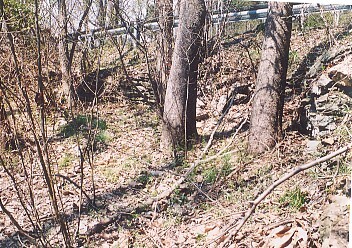 On Great Seneca Creek, 80 ft. upstream from the intersection of Huntmaster Road and Davis Mill Rd. 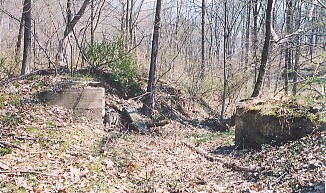 It was built on the Burton property. Benjamin Wollingsford, Lodowick Davis, Charles Greenbury Griffith, Harry (Henry) W. Dorsey. Mary Dorsey Williams Waters, Elisha Owen Williams, Dr. Washington Waters, Washington D. Waters, John Samuel Davis. It was a grist mill, using an oveshoot wheel and later a turbine. It burned down in the 1940's. The turbine is no longer there. In 1754 Benjamin Wollingsford owned the property. Next, it was owned by Lodowick Davis. It is unknown if the mill existed then. 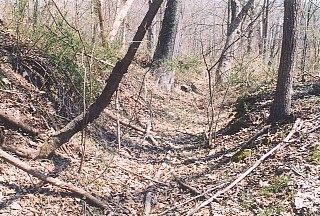 Charles Greenbury Griffith owned the mill when the 1783 Maryland tax assessment record was made showing the existence of the mill. Harry W. Dorsey purchased the mill from Griffith. His daughter, Mary inherited the mill. Her son, Elisha Owen Williams inherited it from her. Elisha was a half brother to Washington Waters. W. Waters' son, Washington D. Waters (b. 1836) then owned the mill. He sold it to John Davis. 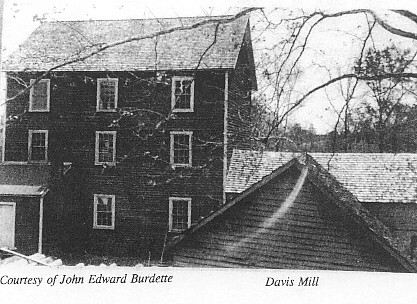 John Davis had worked at Goshen Mills from about 1860 to 1879 as a miller. In the early 1880's he started to lease or purchase Davis Mill. In 1885 the deed for sale was executed for $4,000. Davis' home was situated on Huntmaster Road, on top of a hill overlooking the mill. There, he and his wife, Mary Ellen Phoebus, raised their family of fourteen children. Eleven survived to adulthood. Two sons, William and John, died in infancy, along with a daughter, Lillian. He was very strict with his eleven daughters. Although he did not enlist during the Civil War, John Davis spoke of how he and his family ground flour and baked bread all night long for the troops who were passing through.